Landing for the first time on a Nintendo hardware, these two episodes, especially the first one, are instant classics of the JRPG genre. This Switch version of the HD Remaster is quite clean, technically speaking, with high resolution textures and low loading time. Alas, the cartridge only includes Final Fantasy X (X-2 being available by downloading it), but it's not a reason to pass by these fantastic games. 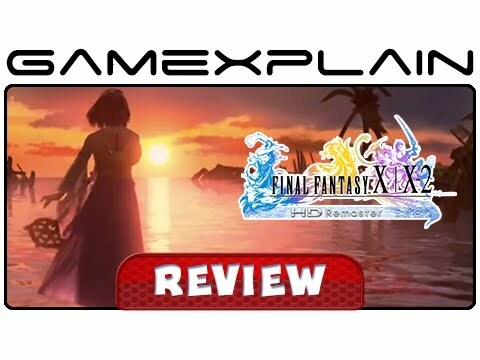 Final Fantasy X / X-2 HD Remaster is a nice fit to the Switch's library, but it adds nothing compared to previous editions of the HD Remaster that appeared on other platforms. All of this leaves us feeling that Square Enix could have done more with the Final Fantasy X and X-2 Remaster. If you own a Nintendo Switch and have never played these games, they're well worth considering. For everyone, else however, there's little reason to dive back in to the world of Spira. The Final Fantasy X | X-2 HD Remaster collection is an incredible package, and it comes to the Switch with virtually the same quality and improvements as every other release before it. Final Fantasy X/X-2 make for a lovely addition to the Switch's library – a touching experience for new and old players. If you haven't played Final Fantasy X by now, it's the perfect time, especially if you own the Switch. If you haven't played it by now, Switch is the perfect platform to try, given the portability and smooth experience. Unfortunately, those who played it recently or want something new might be disappointed, though it's hard to please everyone. Especially when PC and PlayStation 4 have been out for a while and are much cheaper. One great RPG and one curio. Not a perfect port, but definitely Square Enix's best stab at bringing Final Fantasy to PC so far. Upgraded HD visuals make Final Fantasy X/X-2 HD Remaster on PS4 the best way to experience the world of Spira. Whatever you think of the original games this is one of the best HD remakes ever, and a considerable improvement on the already excellent PlayStation 3 and Vita versions. There's no point in trying to sum up Final Fantasy X or X-2's storyline beyond saying that it is every bit as incredible as you remember, cringeworthy laughing sequences and all. The PC version brings accessibility and graphical upgrades, as well as the promises of unofficial mod-based improvements. If this is your first time with Final Fantasy X, I envy you — it's a powerful journey that you won't soon forget. This is a generous remastering of a classic role-playing adventure. Final Fantasy X | X-2 HD Remaster on the PS4 is the best that the games have ever looked. Sharp, crisp visuals bring the always enticing world of Spira to life on the big screen, while the core elements of both titles remain rock solid and impressively polished. The collection represents a great opportunity to jump back to a time when Squaresoft was seemingly unconquerable, and if you're totally new to the franchise, it's difficult to think of a better starting point. Fun Tidbit: There's also the inclusion of a mini story FMV that links FFX and X-2 together and the standalone tower climbing mini game for FFX-2 along with a credits/audio drama. Final Fantasy X/X-2 is an amazing port of classic PlayStation 2 titles, complete with graphical enhancements and newly added features. It's truly the best way to experience the games. Final Fantasy X/X-2 HD Remaster for PC is the definitive version of two great entries in the overall series. There's more than enough additional content packed in, refined visuals and a remastered soundtrack that alone would be worth it, but put on top of it a few of the better Final Fantasy journeys and memorable characters, as well as mechanics and it's an easy recommendation. The graphics have received the expected uptick in resolution, but Square Enix has also given both games a decent once-over, adding additional environmental detail, effects, even facial animations for the main characters.